Gemini 2 was a very successful HAT flight. Compared to our first flight, the Vega 1, Gemini 2 had been upgraded in almost every possible. Like the Gemini 1, the frame was simple, consisting of a few plexiglass boxes, and the parachutes were directly attached to the capsule. A second GoPro was included, angled to capture the balloon during its ascent, pop, and descent. Additionally, there was a new modification to the electronics- A GPS would log altitude, coordinates and speed throughout the flight. The capsule set some new height records for the team, soaring up almost 90,000 feet before bursting and returning to Earth’s surface. Due to its capture by the jetstream for a significant amount of time, the capsule made its landing not in Illinois like previous balloons, but in North Judson Indiana. In addition, unlike previous capsule iterations, there were no major malfunctions in the electronics or cameras. Everything was stored neatly in the SD card, and both GoPros recorded the first half of the flight almost perfectly. Unfortunately, shortly before apogee, the upwards-facing GoPro shut itself down. Because of this, we never saw a direct image of the balloon popping, although the capsule flipped giving us the image of balloon parts and the parachute. 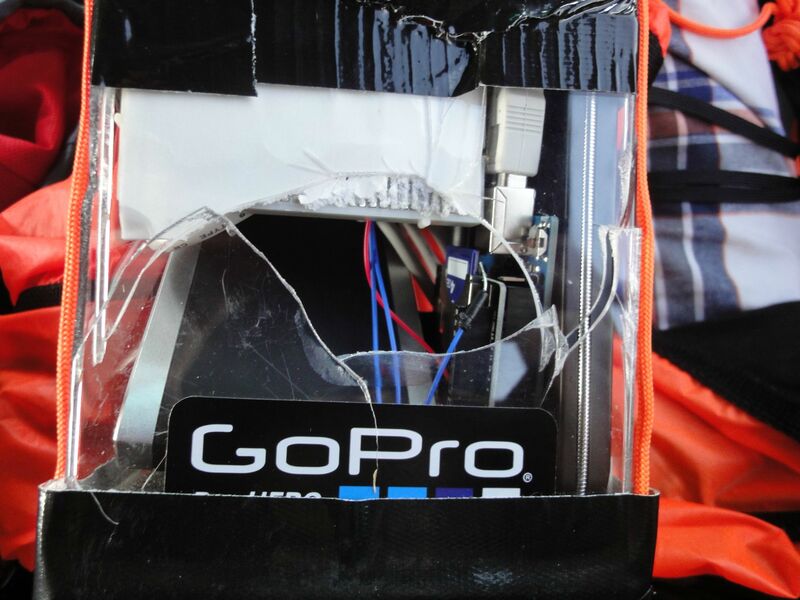 Upon landing, the bottom of the capsule shattered and the camera fell off of the module.